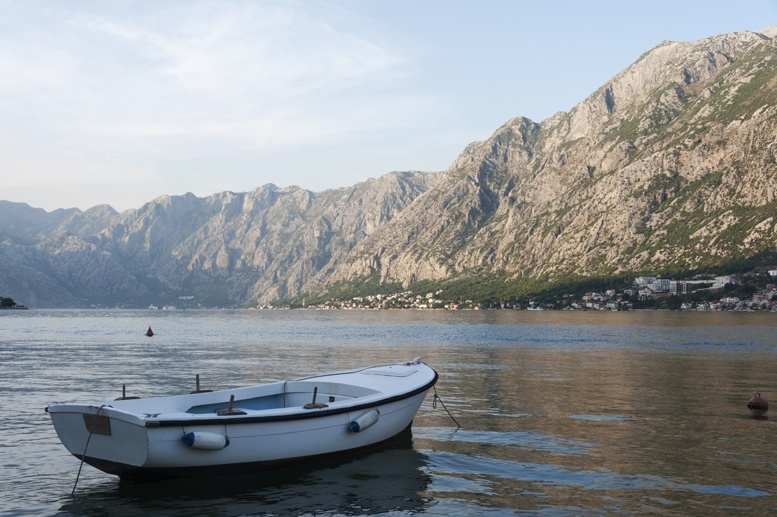 Welcome to Montenegro, one of the most beautiful countries we’ve ever seen, home to the stunning Bay of Kotor. 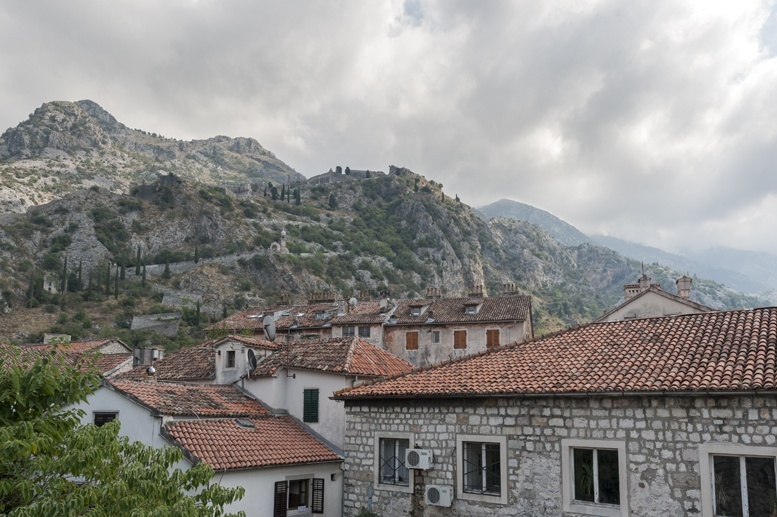 Montenegro was the last stop of our summer 2015 Eurail trip – we’ve prepared this photo story for you, sharing 25 pictures and reasons to visit Montenegro – even though we only managed to visit sights around the Bay of Kotor! ‘Now they call it Montenegro…’ said Zohra, the mother-in-law of fellow blogger SJ, as we ate dinner the night before we left Zadar for Kotor. 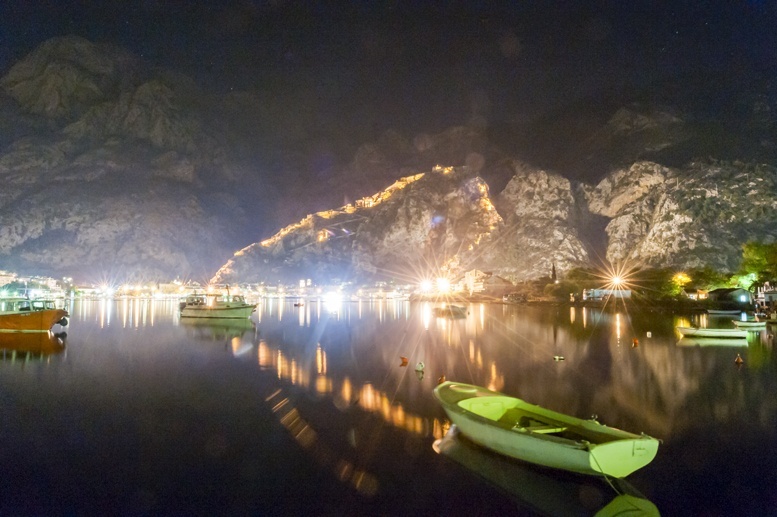 She was talking about Boka Kotorska, the place of her birth, the bay surrounding the city of Kotor. Now they call it Montenegro – ‘it’s different now, but before we were all the same‘ she added. In the last thirty years, the land has been part of the Socialist Federal Republic of Yugoslavia, of the Federal Republic of Yugoslavia, of Serbia and Montenegro, before separating from Serbia in 2006. Going back through the centuries, what is now Montenegro has changed hands several times. It has been ruled by the Venetians, the Ottomans, the Italians, the Yugoslavs, the French, the Austro-Hungarians. Yet, Montenegro has existed as a separate entity since the 16th century – when Italy was still divided in a myriad of principalities and statelets. 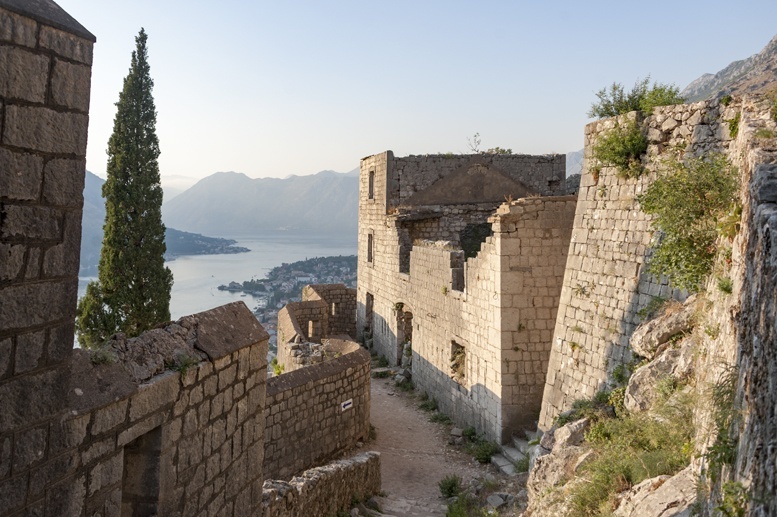 Exploring Kotor, we uncovered some of the layers of this country’s complicated history. Montenegro sits at the crossroads between Europe and the East, where Roman Catholicism, the Orthodox faith and Islam intersect. We visited the Romanesque Cathedral of St Tryphon, patron of gardens and winegrowers, whose remains were smuggled to Kotor from Costantinople. We braved the climb up Kotor Fortress, the fortification on St John’s Hill behind the old city that were first erected in Illyrian times. The sun shone mercilessly on the bare rock, even in the late afternoon – but the more we climbed, one switchback after another, the more of the bay opened to our eyes – until we felt like the city guards of yesteryear, protecting the bay from raids and pirates. 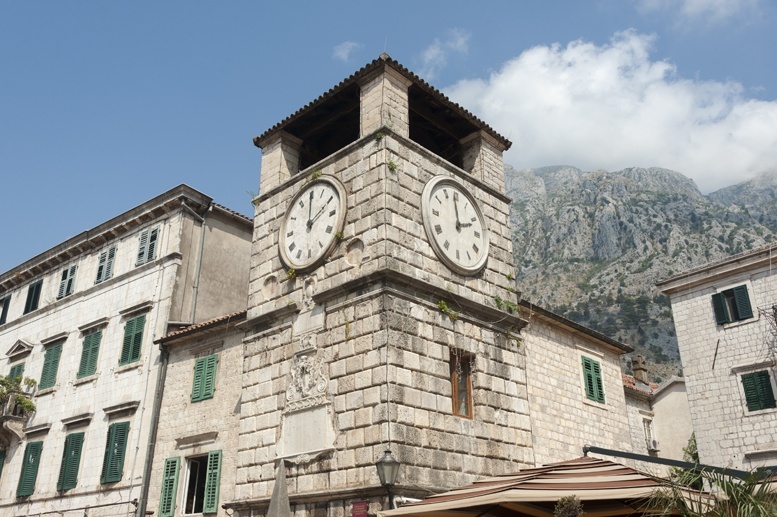 We stood in front of Kotor Clock Tower, the symbol of the city, and spied into the watchmaker shop that has been run by the same family for over 300 years. 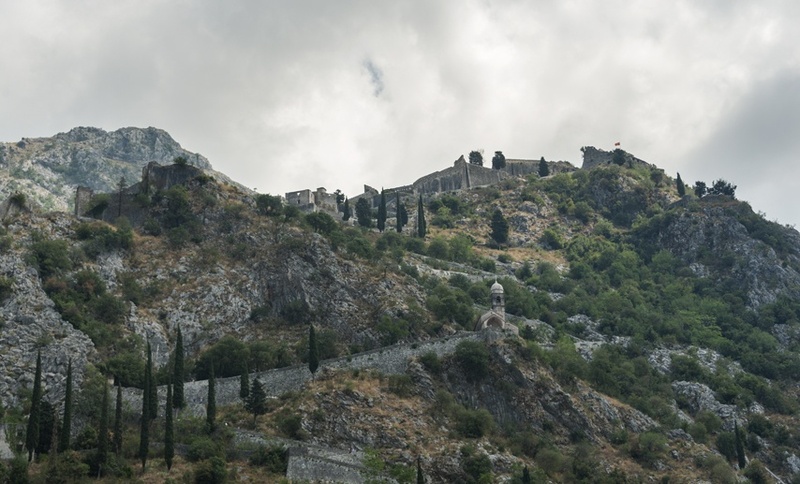 Our guide told us of the catastrophic 1979 earthquake that almost leveled Kotor, erasing in a few minutes the town that withstood Visigoth, Ottoman and British assaults. Another day, we visited Perast and its museum, a treasure trove of ancient maritime charts, paintings and period furniture, and even a poem in Venetian dialect written on the day the Venetians left Kotor, taking their lion banners with them. Then, we sailed to the tiny church of St Mary of the Rocks, built on a man-made island after an effigy of the Madonna was found lying on the rocks by local fishermen. We wandered around the Bay of Kotor for days on end, visiting the fishing villages of Muo and Prčanj, sitting down for long, lazy seafood lunches. 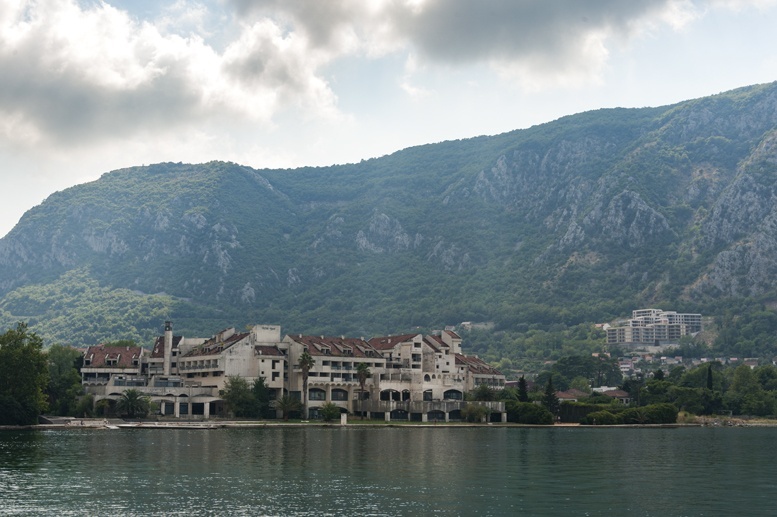 We had planned to explore the mountains, Cetinje and Durmitor National Park but the Bay of Kotor just captivated us – several hours were spent gazing at the point where the Lovčen mountains meet the sea, at cruise ships crossing the bay after negotiating its narrowest point, only 300 meters wide. The Bay of Kotor, sometimes called ‘Europe’s southernmost fjord’, may look like a fjord but in fact is a ria, a submerged glacial valley created by a now-vanished river. 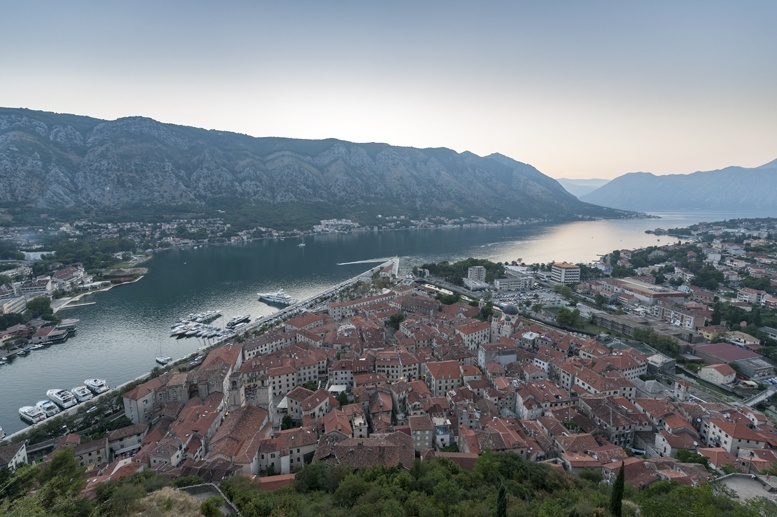 A place as magical as the tales and legends surrounding the birth of Kotor – some say it was built by the Argonauts after they conquered the Golden Fleece, others believe its location was chosen by a fairy. The Bay of Kotor was our Montenegro – we’re aware there’s a lot more to see and we do hope we’ll be back to explore more of this beautiful country. 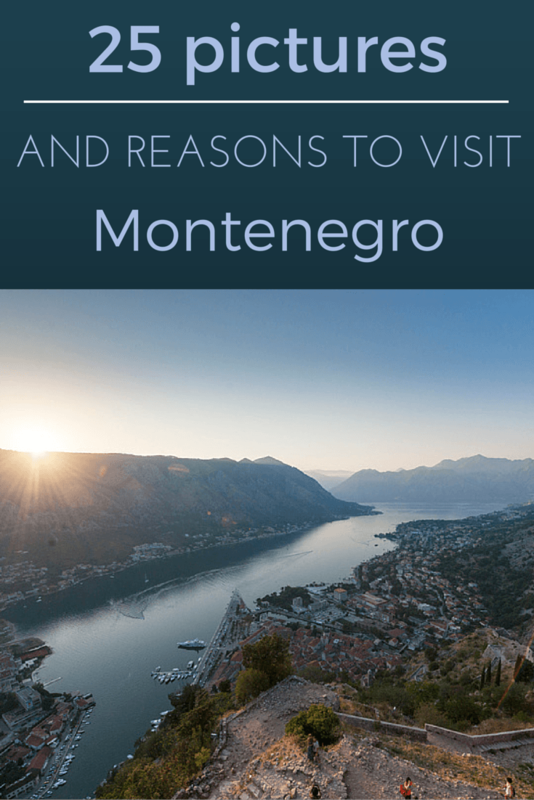 Here are our best 25 pictures and reasons to visit Montenegro – or at least, to visit the Bay of Kotor, especially if you’re travelling in summer. Somehow, though, I believe this place is surely worth a visit year round. 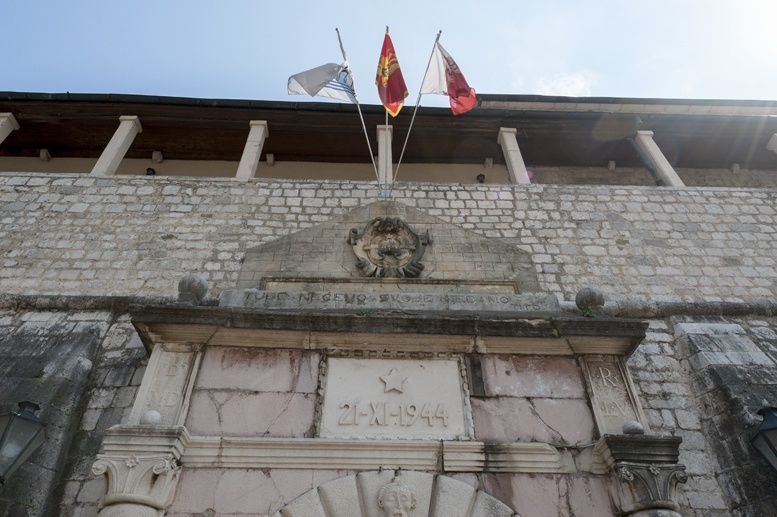 Layers of history – Venetian walls, a Yugoslav Socialist plaque, and the flag of modern Montenegro – the double-headed eagle is Byzantine and Roman in origin and has been used as a symbol of Montenegro since the middle-ages. 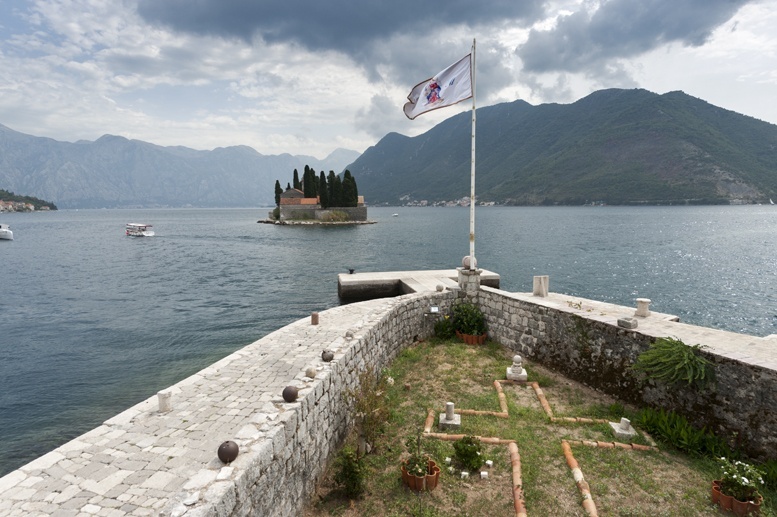 The date commemorates the liberation of Kotor from Axis occupation by Yugoslav partisans. Around Kotor Old Town you’ll wander among the palaces and mansions of noblemen and wealthy Kotor residents. Just around the corner from this square you’ll find the Beskuca Palace, one of the most beautiful in the Old City. 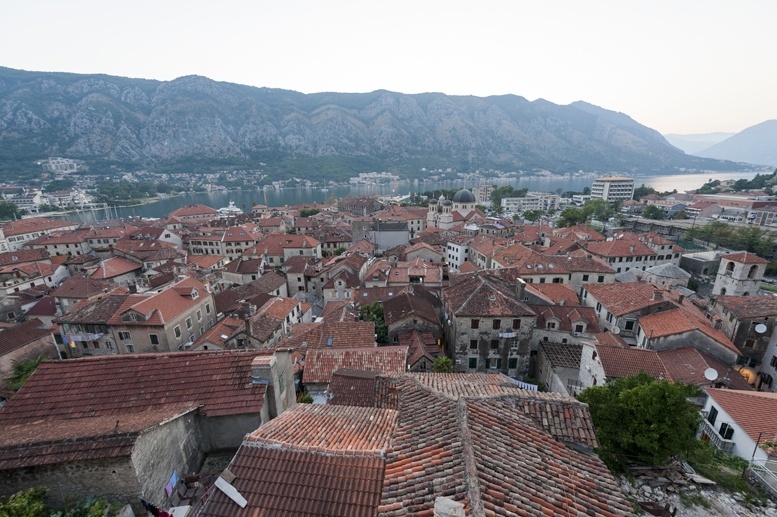 Beskuca means ‘homeless’ – the family was given that name because they arrived in Kotor as poor, homeless people. After amassing considerable wealth and receiving the title of Count, Jozo Beskuca started building homes – his aim was to build one hundred, in order to change his family name to Stokuca (one hundred homes). Sadly, he fell short of just one. The magnificent Cathedral of St Tryphon, was first built in 1166 but rebuilt and extended over time, after having suffered damages because of several earthquakes. The terrace on the church façade is a great place to view the square from above. 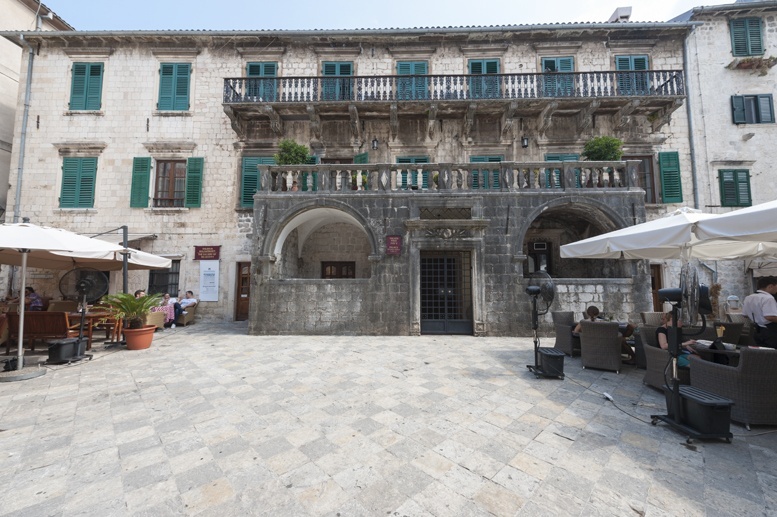 After the 1979 earthquake, Kotor Old Town was evacuated and closed for several years while restoration and building works took place. 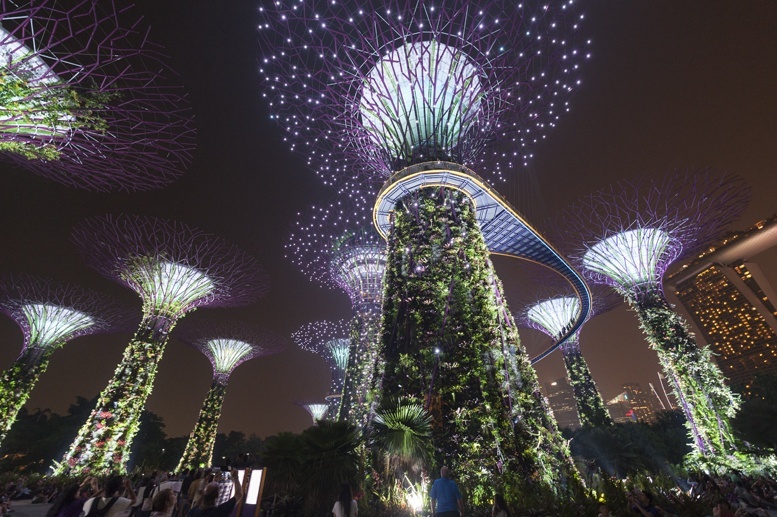 Residents and visitors started to return only in 1984 – now, the city is listed as a UNESCO World heritage site. 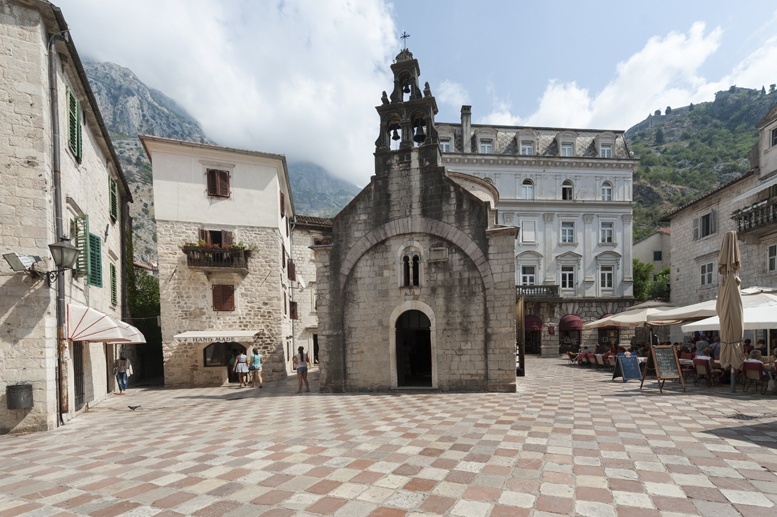 The small Orthodox church of St Luke (Sveti Luka) stands in the centre of a square in Kotor Old Town. 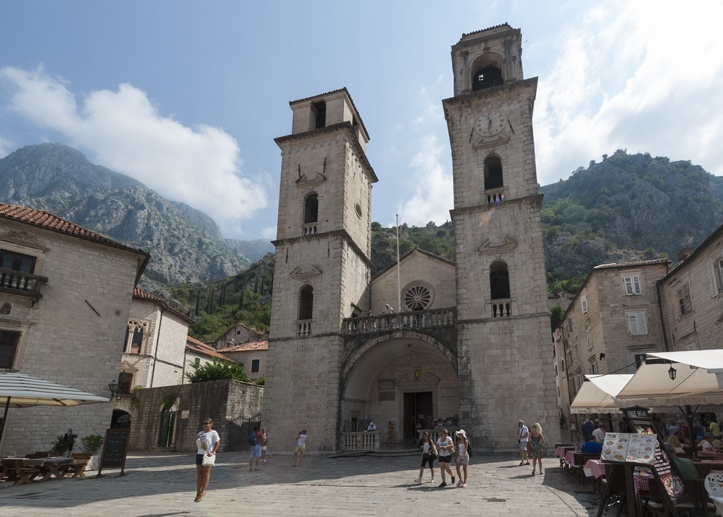 There are many more Catholic than Orthodox churches in Kotor, despite the population being mostly Orthodox. Kotor is completely surrounded by walls, which snake up to the mountain of St John behind the old town. Sadly, you can’t walk all around – but climbing to the top of the fortress on the mountain is one of the best things to do in Kotor. 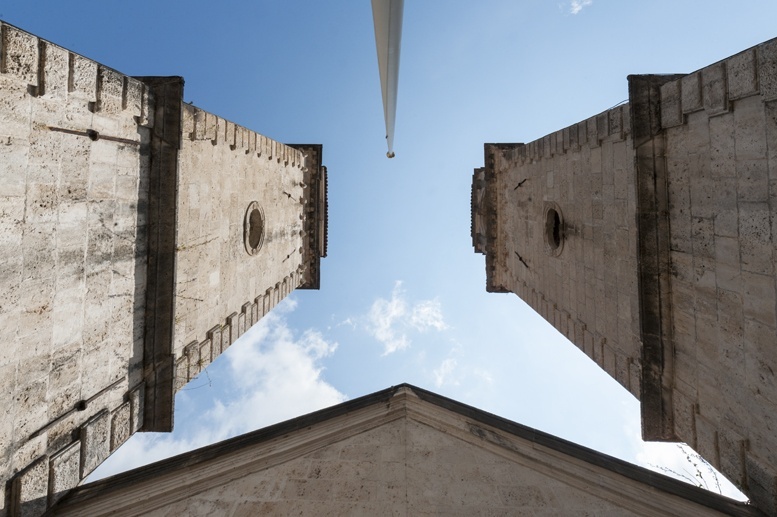 The clock tower is one of Kotor’s icons, it has been keeping the time in town since 1602. The same family of watchmakers have been maintaining the clock from their small workshop on the base of the clock tower – we were told the clock stopped working just once, after the 1979 earthquake. Once a luxurious hotel, now a dilapidated ruin, we thought Hotel Fjord still looks fascinating with its Eighties Futuristic architecture and great location overlooking the bay. Sadly, we couldn’t explore inside – I guess we’ll try again next time. If you only have time to do one thing in Kotor, make it the hike to the top of Kotor Fortress – also known as St John’s Castle or Castle of San Giovanni. Roughly halfway you’ll find the tiny church of Our Lady of Health – just turn around for a minute and check out the view. 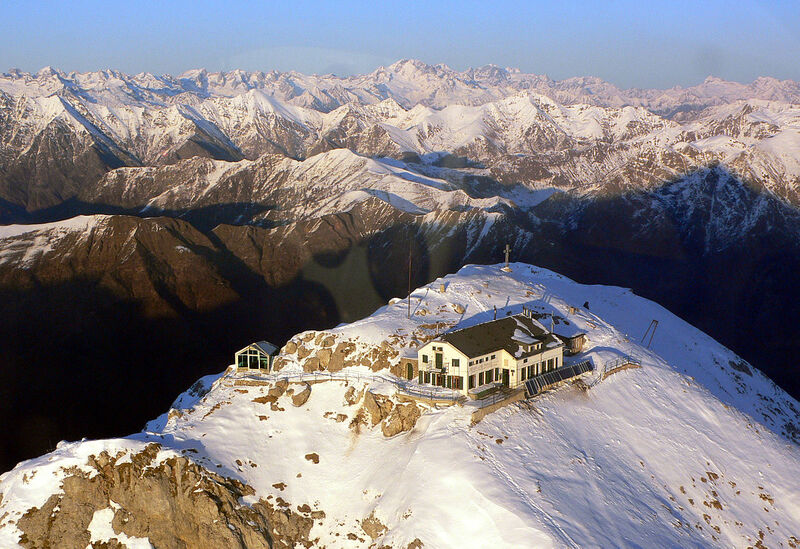 On your way up, the views are definitely jaw-dropping – but don’t forget to check the ruins of the fortress itself. The first stone was laid in Illyrian times, and the fortress was attacked several times over the centuries – most recently by the British in 1814. 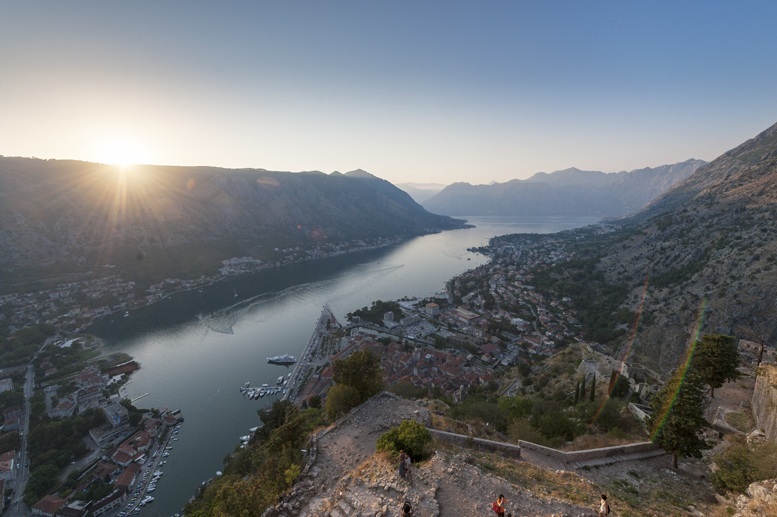 Trust me, the hike to the top of Kotor’s Fortifications is a hot and sweaty one, with over 1200 steps – but the views are worth every single one of them! 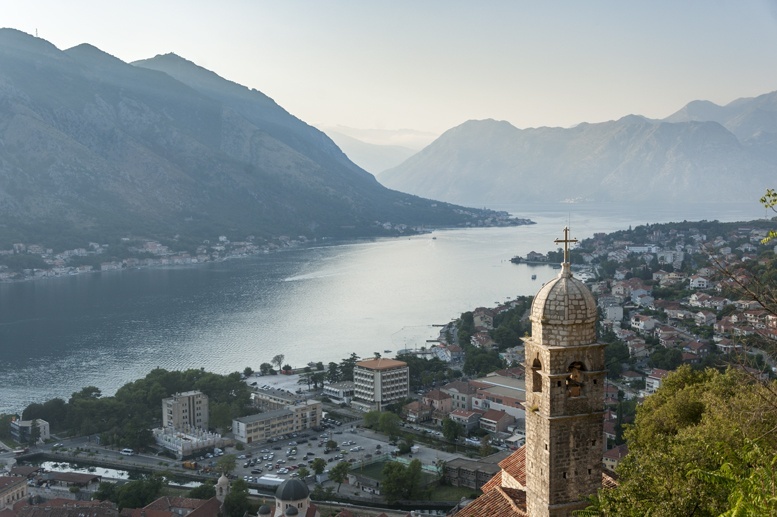 Check out the Old Town and the Bay of Kotor from the chapel right at the top. Instead of walking up through the old town (which will cost you €3 per person), a reader told us that it’s possible to walk around the mountain and take a lesser-known path up to the top. This will turn a 2/3 hour hike into a full day adventure, but you may be lucky and be invited by local farmers to taste olives and cheese. 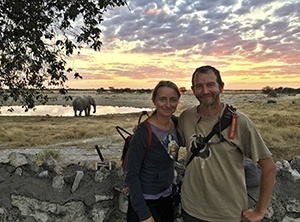 Ask locally for directions – we visited in the height of summer when the hike is not recommended, otherwise we would’ve done it! Food in Montenegro is absolutely delicious – similar to Croatian and Italian, with lots of pasta, seafood and my very own favourite, black risotto. Restaurants in Kotor Old Town are kind of overpriced – head to the villages of Muo and Prčanj for authentic food at more affordable prices. Bokeski Gusti in Prčanj was our favourite restaurant – sorry we have no food pics. The seafood platter was just too good! We decided to stay outside the Old Town during our time in Montenegro, and chose the fishing village of Muo as a base. It’s only 2.5 km away from the old town – there’s an hourly bus, otherwise it’s a really pretty walk along the bay. 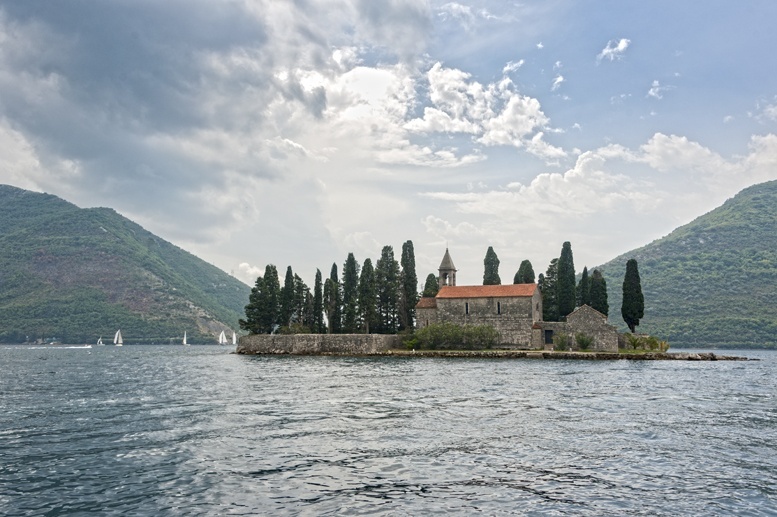 Perast, a small town 11 kilometers away from Kotor, is worth a visit as a day or half-day trip. Here’s a view of the bay from where the bus drops you off – a good start, right? Take a cruise around the bay to see it from a different perspective – even on a stormy day. This artificial island was built on sunken boats after locals found an image of the Virgin Mary on the rocks. 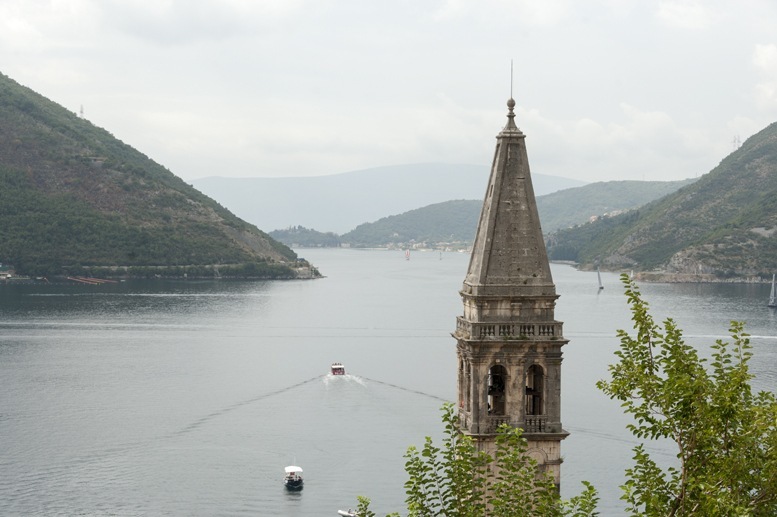 Don’t miss it – the return boat trip costs €5 from Perast. 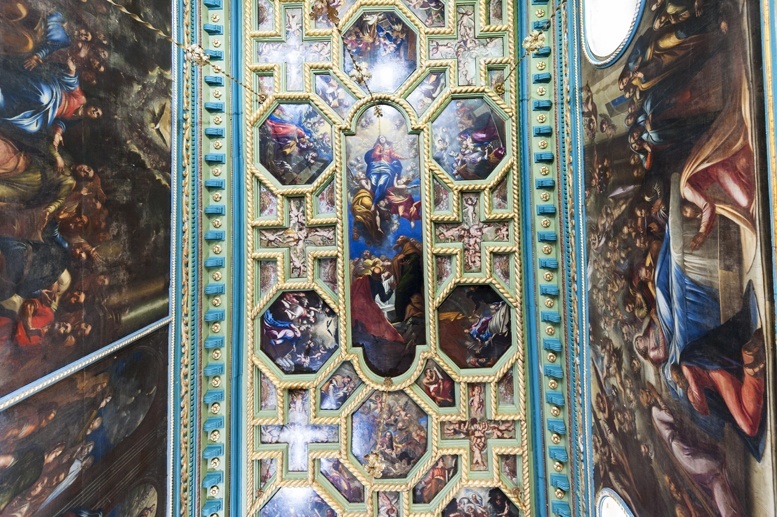 Entrance to the church is free – check out the paintings. Plenty of those in Montenegro. 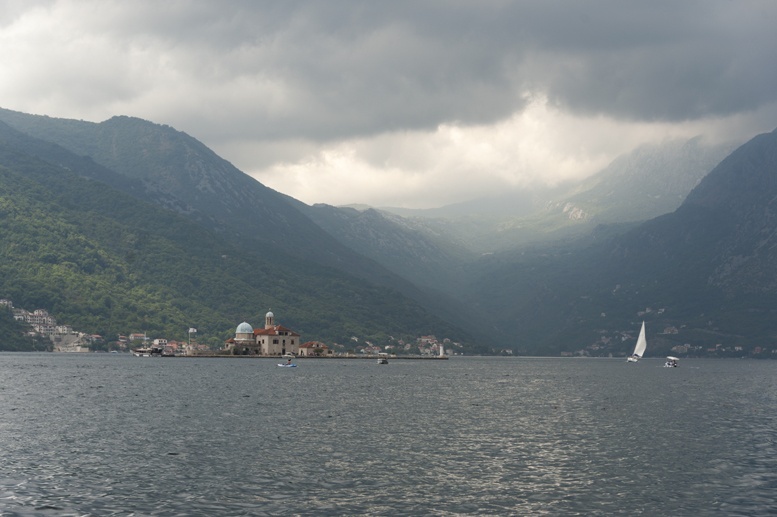 Here are Old Perast and Our Lady of the Rocks. The little island of St George is right next to Our Lady of the Rocks (from where this pic was taken). It houses an old monastery and graveyard – just rent a kayak paddle around it for a closer view! 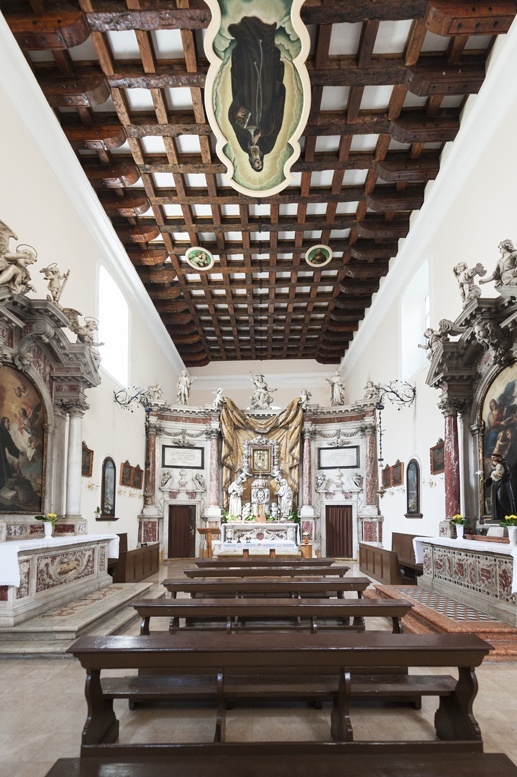 Back in Kotor, make sure you visit St Clara Church to see the stunning Baroque altar designed by Francesco Penso Cabianca, a Venetian architect. 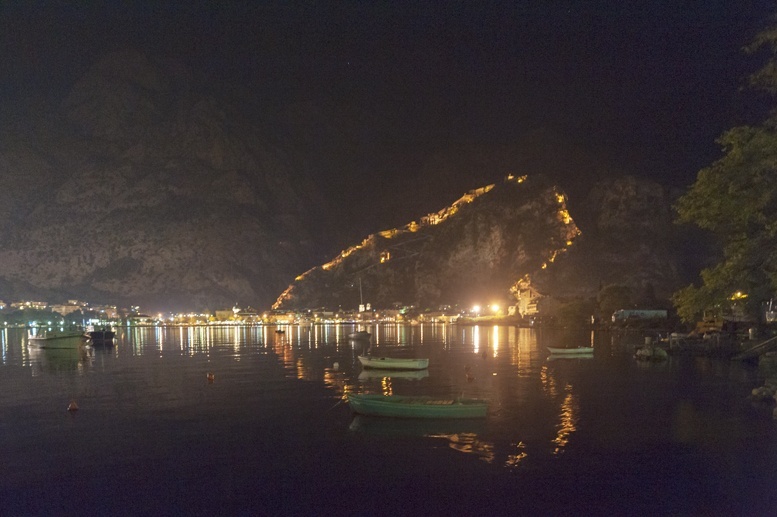 When the night falls and the moon comes up, the walls of Kotor Fortress are lit up and the whole bay looks even prettier. We cycle toured through Montenegro this summer and absolutely loved it. The scenery was just stunning. I wish we could have seen more of the off-road areas! 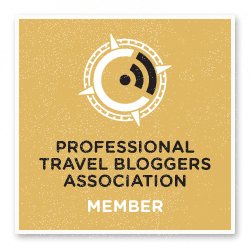 We are heading to Montenegro in November, and we will definitely need to put the Bay of Kotor on our list! Great post and beautiful photos. Thanks so much Katherine! Hope you enjoy Montenegro! 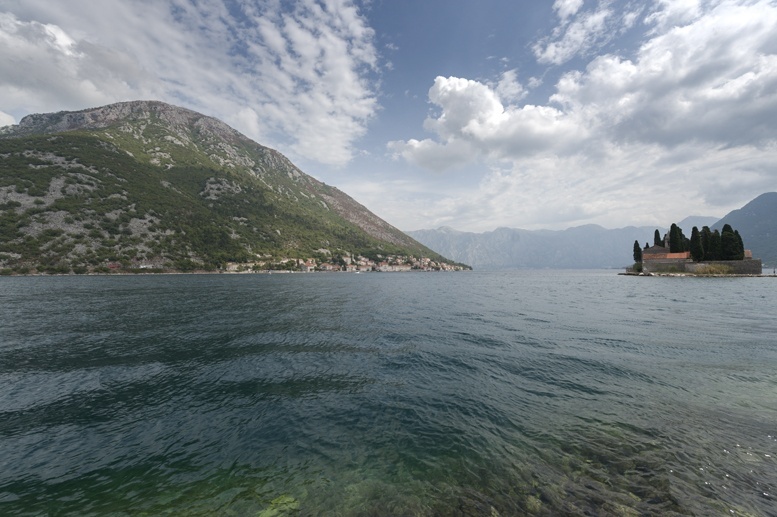 Great post with so much of the central part of the Montenegrin coastline. Thank you for sharing. There is lots more to see here on the coast and even more so inland with the mountains, canyons, lakes, rivers, and villages. Next time you happen this way let me know. I would be happy to share more of the unknown goodness in this gem of the Mediterranean. Will do for sure! Thanks so much, would love to visit Montenegro again!